Hello friends. So it may be a bit early, but if you follow me on Facebook or Instagram, you know that my Christmas decorating is done. 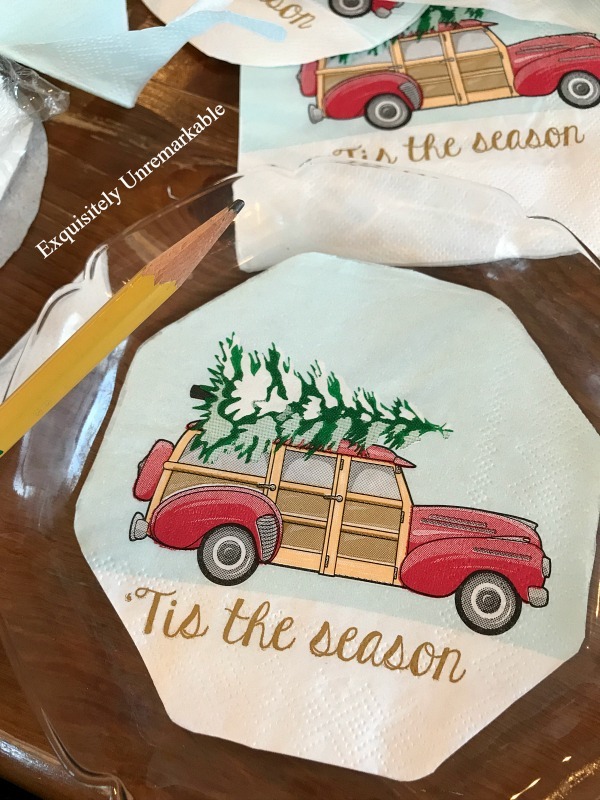 I went with a simple theme (again) this year, so it didn't take long to complete the task and now I get to move on to the fun stuff...Christmas crafting!! 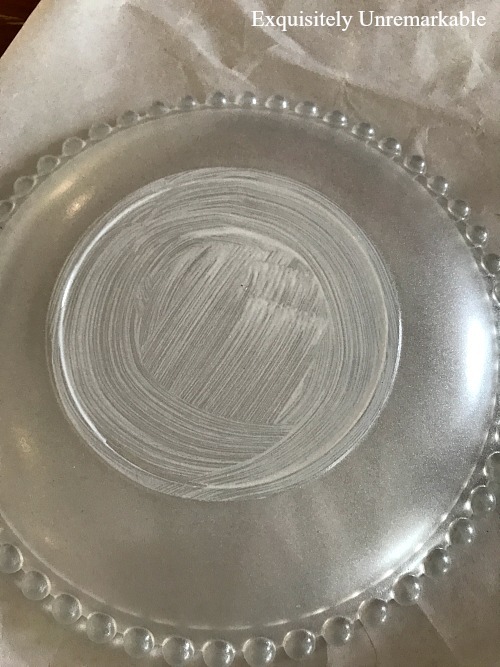 I have a pretty big list of things I want to accomplish this season, but today, I started by transforming a few glass thrift store plates with cocktail napkins. It's a craft I've been waiting to do since Halloween when the stores started decorating for Christmas and I found these pretties next to the jack-o-lanterns. Oh boy. And I thought I was early! Believe it or not, this red obsessed girl doesn't own one red Christmas car/ truck/ wagon item. The images are darling, but the prices and the fact that I don't have much storage around here, have kept me at bay. 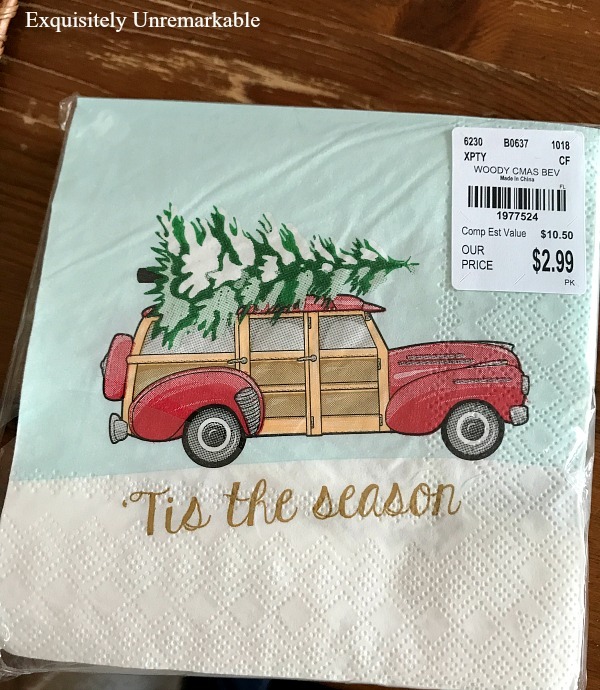 So when I spotted these napkins for under three bucks, I knew it would be a cheap way to get my fix and to use up some of those old dishes I found at the thrift store this spring. When I was unable to remove that awful film, I gave some of them a faux milk glass treatment and some a coat of frosted spray paint. The frosted dishes are the ones that received a makeover today. I thought the finish gave them a wintery air and they'd look great with the snowy scene and that red truck. When I tucked the napkin under the plate to eyeball it, I could see that I wasn't wrong. 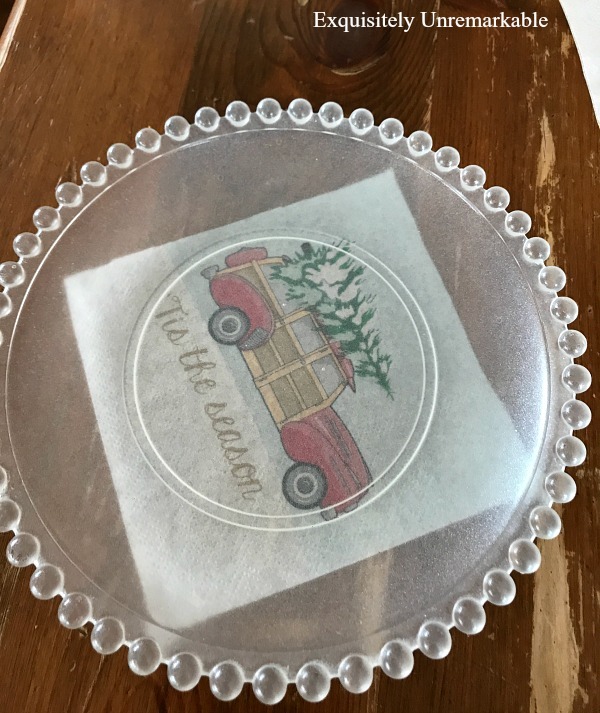 For this plate, I decoupaged the napkin to the back of the plate, so I traced the bottom ring onto a piece of paper for my pattern. 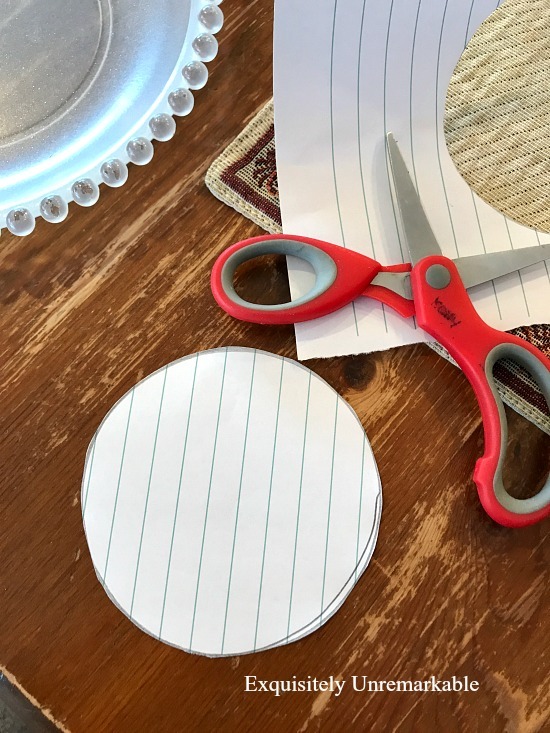 I made a template so I knew exactly what and where to cut so my napkin would fit perfectly. Next, I separated the napkin so it was just one ply. I could've cut through both pieces, but I was afraid they would shift or separate on their own while I was cutting. Of course, it was a little more delicate to work with, but I was careful and took my time. Case in point, sketching the pattern onto the napkin with pencil. I went slow so I didn't tear my pretty picture. I also used a dull pencil so the point wouldn't tear the thin paper. When the cutting was done, I gave the back of my dish a coat of decoupage gel with a foam brush. I used a satin coat for this, but honestly, since it's on the back and no part of it will ever show, I could've used any kind of finish. I placed my napkin face down on the plate and began to smooth it out gently using a trick from my friend Ann. She recommends using plastic wrap to smooth down the napkin to prevent tearing, but I didn't have plastic wrap...so I used a sandwich sized zippy bag. Don't laugh, it worked. Once my wrinkles were smooth, I used a bristle brush to put more decoupage over the napkin to seal it and reached for my trusty bag again. 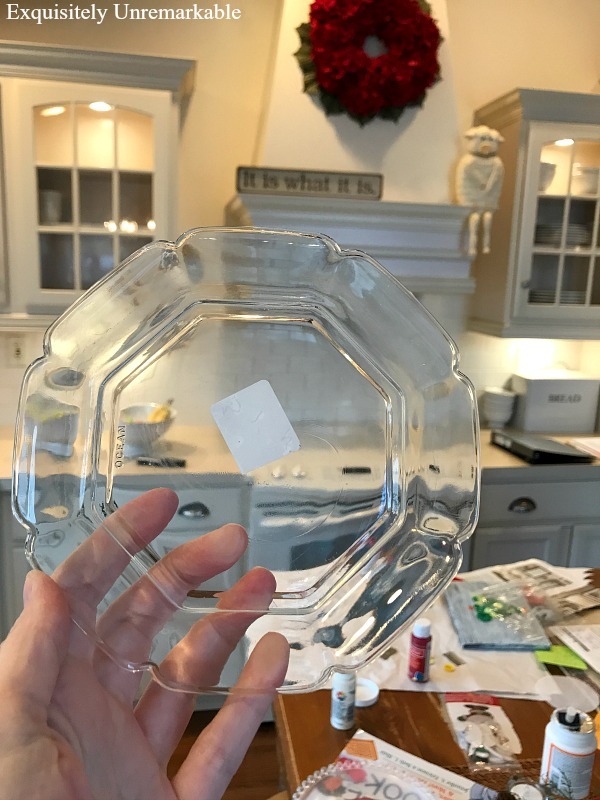 When my plate was smooth and dry, I had a very elegant Christmas accent piece. 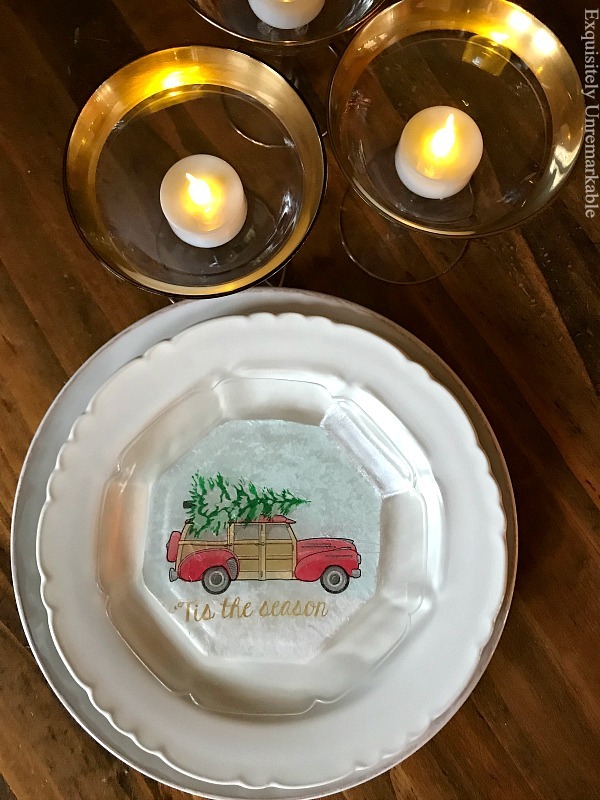 The frosting does indeed compliment the snowy affect on the napkin and now I have my very own little red Christmas wagon plate. Look at me getting all trendy. Of course, if you know me at all, you know that I can never have too much red around here. One plate was just not going to do. So I made another...with a different thrift store glass plate. This one was a buck and it was a fun shape, with an octagon in the center. I thought it would make for an interesting piece. I was also excited to add my colorful napkin to the front of the plate this time. The frosted plate is a bit muted since the napkin was applied to the back. I thought the contrast would be interesting. My process here was basically the same, except it was almost impossible to get a good tracing of the center, so instead I placed the napkin in the plate and folded the corners down one at at time in the shape of the dish and cut on the folds. I coated the center with decoupage, placed this napkin face up in the dish and grabbed another plastic bag to smooth my wrinkles. Then I applied more decoupage over the top and smoothed it out again. 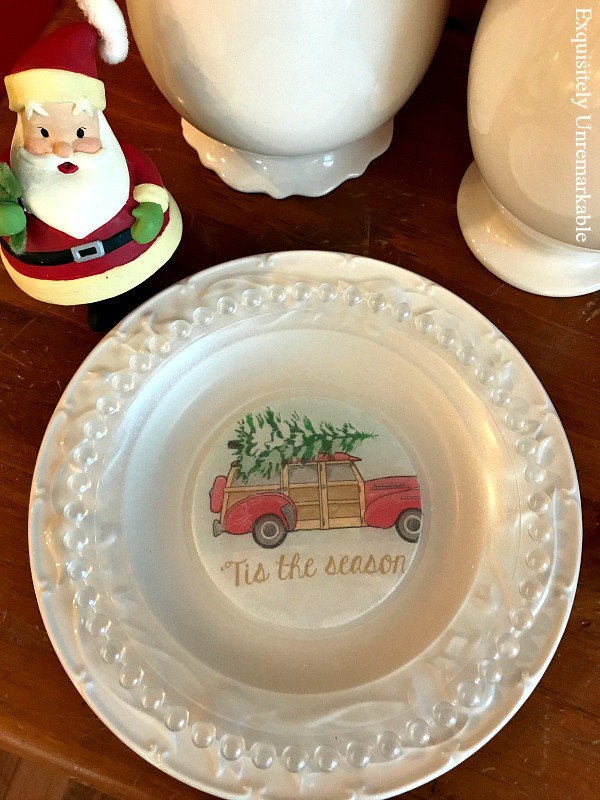 This time, I used a sparkle decoupage, since it was on the front of the plate...and shimmer is perfect for Christmas. As a matter of fact it's so perfect, that I coated the entire plate with it. They're not for eating so I don't have be concerned about that, and the more sparkle the better! This time around I had a brighter version, still elegant, but with a bit more pop. 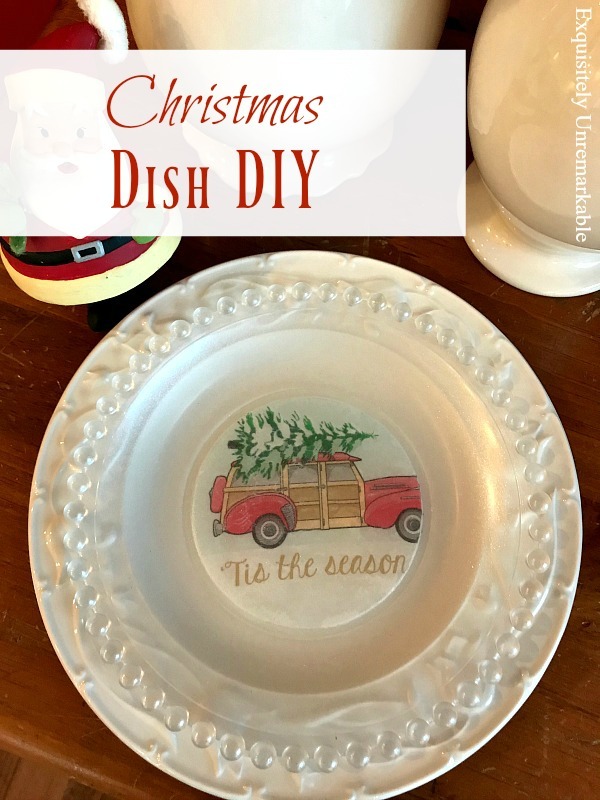 I have to say this was a relatively simple craft, a great way to upcycle a few old dishes and an elegant way to add a little Christmas cheer. And all for under three bucks! Oh Kim, they turned out so cute. I too love those red trucks hauling the Christmas trees. Thanks Lorri! Those napkins were just too cute to resist! 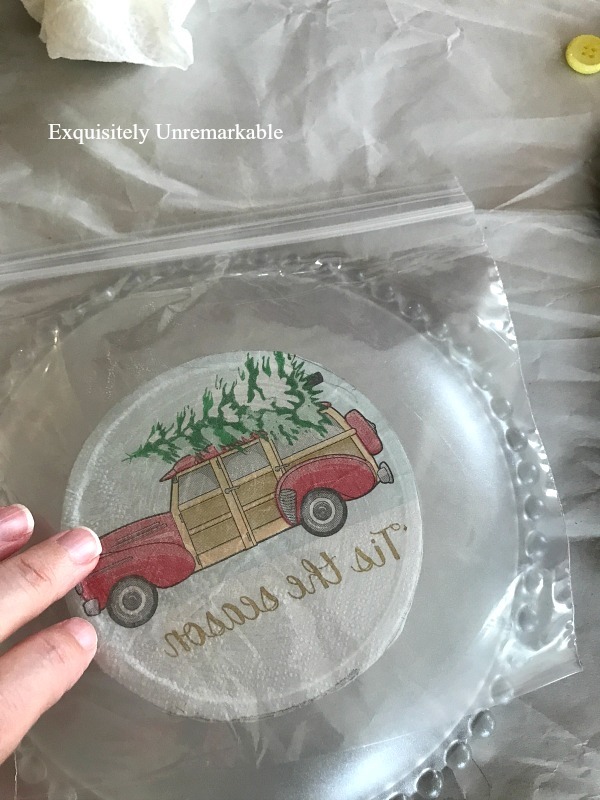 I too love Christmas crafting and I love this simple craft to decorate a clear plate! It will look really nice for the holidays. Thanks so much, Julie! It was a very quick and easy project. Just the way I like them. They turned out wonderful! I should be finished with my decorating over the next two days. Thank you, Penny and enjoy the process and the result! These are super cute Kim. You got your crafty going nicely! Love the red truck and tree just adorable. That is a great project! ❤️ Live the truck! Thanks Susan! 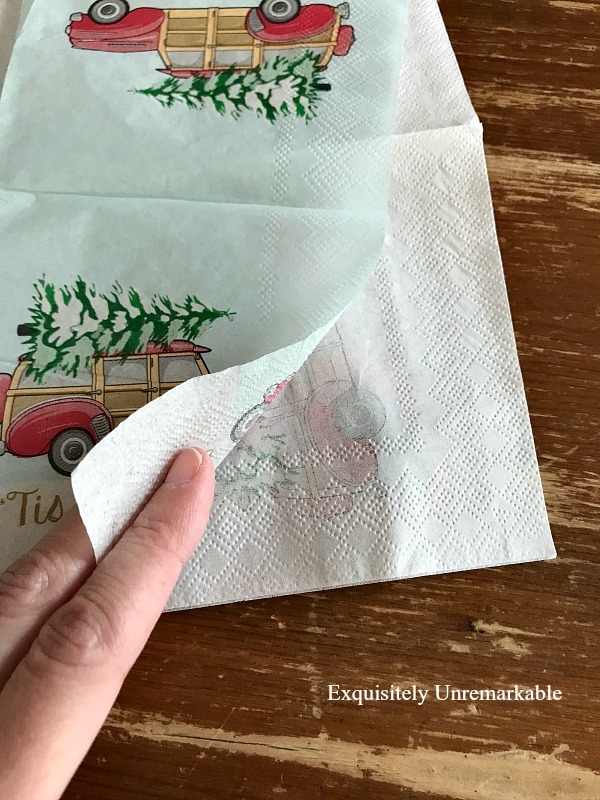 I just had to have those napkins and they were too pretty to use and toss! Jan, you are so sweet! Thank you so much. This was a very clever craft Kim. I too end up with a lot of plates that I don't know what to do with. This is a great way to spruce them up and use them for Christmas. Thanks Mary! The cheap thrift store plates are just too pretty to pass up sometimes. This is an easy way to give them a little personality and display them. Turned out so cute Kim! I’ve covered the entire plate before, but love this look!! Thanks so much, Jann!! It's a little more time consuming to do only a portion of the plate, but I like the outcome, too! I love those red trucks and trees! The plates both turned out adorable! Thanks Mari! I thought it would be a neat way to add the trucks to my home. Aww, thanks for the shout-out, Kim. Your dishes are adorable and it's good to know sandwich bags work just as well as plastic wrap! Ann...your tip made a huge difference. I can't even tell you how easy it made the process. Thank you so much!! The little red Christmas wagon is so iconic. 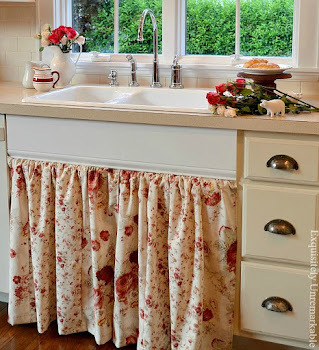 What a great and economical way to get the look; the plates are fabulous! Sara, I am so cheap and this was such an easy way to include a little bit of this trend into my holiday decor...and thanks! Thanks Lynne!! I did my best with this one. It took a little while to get it all done, but I think it was worth it! This is adorable. It adds charm to your already lovely home! Thanks so much, Maria!! What a lovely compliment. Very cute plates Kim. 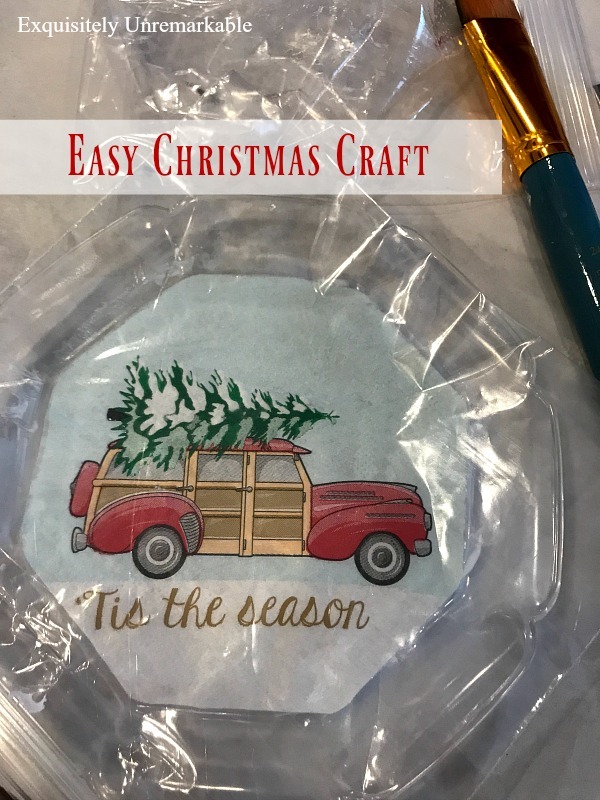 So inexpensive to create and they are perfect for Christmas. Kim, I love the plates! They are adorable and are a cute addition to your Christmas decorations! I bought some napkins with the same image on them the other day (minus the wording) and I was wondering what to do with them. Great idea for the decoupage! Love and hugs! So cute and goes perfectly with the red in your pretty home! Love it! Thank you Lisa! I have to say the red helps..ha! Kim, this is darling--great Christmas craft! Thanks Cecilia! It was quick, easy and cheap way to get trendy! perfect! those little woody wagons with the tree on top tug at the heartstrings! Thanks so much, Marilyn! 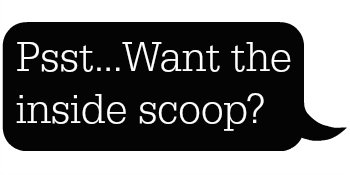 I'm all for quick and easy projects that I can enjoy right away!! Happy Holiday Season! I am so into little trucks with trees on top. :-) LOVE IT! Thank you again, for another great idea. Oh kim you are brilliant! This is awesome! I may get courage to do a project like this someday. Wishing you a Merry Christmas, lots of love and time with family! 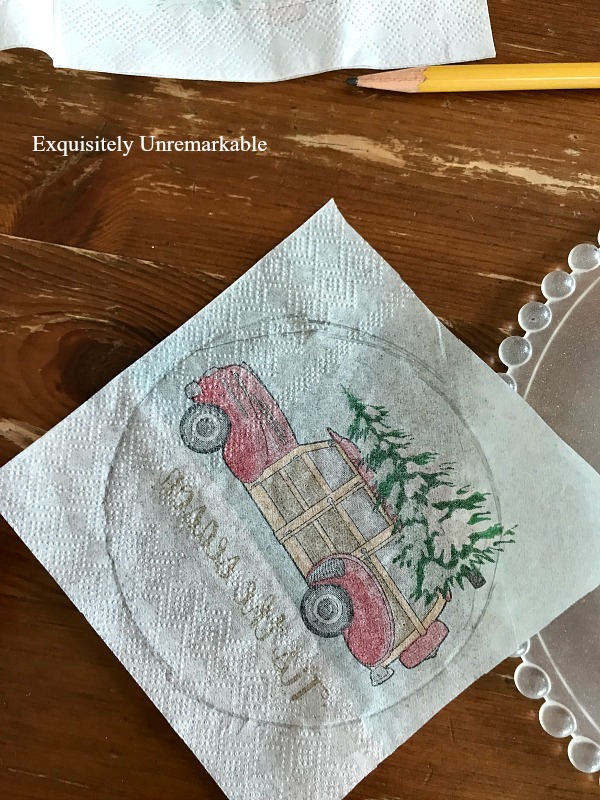 Angela, you are so talented, I have no doubt that you could whip this up in no time...and if you want a few napkins to try, let me know. I have several in this pattern left over! And thank you, I hope you had the merriest of Christmases with your family! These turned out great! The sparkle mod podge is a great idea, reminds me of the sparkle on freshly fallen snow. Thanks Audra...I figured Christmas was a good time for sparkle!